The West Bottoms Reborn walking tours and lectures are a vision of artistically driven community programming, curated and developed by project team artist Carmen Moreno. The tours are designed as a creative art based process of spacial investigation - By engaging with community and place this artists team will attempt to guide the public through exercises that provide insights into history, place, and transformation. Carmen Moreno is a visual artist, poet, and performer. She received her BFA in 2010 from the Kansas City Art Institute in Interdisciplinary Art and Creative Writing with a certification in Community Arts and Service Learning. She is currently working as an independent artist in Kansas City and has exhibited her works and ideas all over the world. Her works are generated by her interests in Latina Futurism, feminism theory, science, art, and philosophy. In applying the sensibilities of science to art, Carmen attempts to create a visual language that transforms emotional-intuitive experiences into innovative installations and performances. Mary Kuvet is an artist, writer, and curator based in Kansas City, MO. Originally from south Texas, Mary has lived in the cities of McAllen, Seguin, and San Antonio. Her work is heavily influenced by the Latinx culture of south Texas and in a broader sense cultural hybridity within the United States. 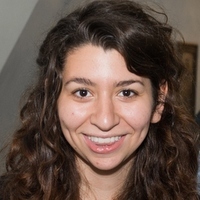 Mary was a 2015 - 2017 Andrew W. Mellon Undergraduate Curatorial Fellow at the Nelson-Atkins Museum of Art. She is currently a senior at the Kansas City Art Institute pursuing a double major in Art History and Painting.